Warren Stevens travels to Washington, D.C. The local delegation traveling to Washington, D.C., and posing here outside Sen. Sherrod Brown’s office, included, back row from left, Barb Wilinski, Barb Diver, Donna Shaw, Becky Schindler, Clete Schindler, Pam Manges, Warren Stevens, front row from left, Nikki Hurt (Sen. Brown staff member) and Lauren Coatoam (kneeling). Last month more than 750 cancer patients, survivors, volunteers and staff from all 50 states and nearly every congressional district gathered in Washington, D.C., as part of the annual American Cancer Society Cancer Action Network (ACS CAN) Leadership Summit and Lobby Day. Advocates urged Congress to take specific steps to make cancer a national priority and help end a disease that kills 1,600 people a day in this country. Warren Stevens of Urbana met with federal legislators to discuss the need to support an increase in federal funding for cancer research. He asked them to co-sponsor legislation that supports patients’ quality of life, and to support legislation that would close a loophole in Medicare that often results in surprise costs for seniors when a polyp is found during a routine colonoscopy. Co-sponsor legislation to improve the quality of life of cancer patients with better access to palliative care. From the moment a person hears “you have cancer,” there may be pain, stress and other side effects. Sometimes the problem is made worse by poor coordination among the doctors, nurses and specialists on a patient’s treatment team. It doesn’t have to be this way. There is an extra layer of support widely available to patients and their caregivers called palliative care. In addition to their curative treatment, patients can receive help from a team that often includes a palliative care specialist, a nurse, a social worker, a pharmacist and a psychologist to better coordinate care and manage symptoms while undergoing treatment. Co-sponsor the Removing Barriers to Colorectal Cancer Screenings Act. An estimated 137,000 people in America will be diagnosed with colorectal cancer and 50,000 people will die from the disease this year. Half of these deaths could be prevented if everyone over the age of 50 received screening. The biggest barriers to screening are co-pays and other patient costs. While co-pays have been mostly eliminated in the private insurance market, Medicare patients can still get hit with a bill because of a rule that makes them pay if a polyp is found, changing the classification of their colonoscopy from a “screening” to a diagnostic procedure. By passing this legislation that will repair this rule that is essentially an oversight in the laws, Congress could help meet the goal of getting 80 percent of eligible Americans regularly screened for colorectal cancer by 2018. Before meeting with their legislators, cancer advocates attended training sessions on communicating with elected officials, conducting grassroots activities in their communities and engaging the media. The ACS CAN Lobby Day culminated with an evening Lights of Hope ceremony in front of the U.S. Capitol Reflecting Pool featuring thousands of lights lit in honor of a cancer survivor or to memorialize a loved one who lost his or her fight with the disease. ACS CAN is the non-profit, non-partisan advocacy affiliate organization of the American Cancer Society, which is dedicated to eliminating cancer as a major health problem. ACS CAN works to encourage lawmakers, candidates and government officials to support laws and policies that will make cancer a top national priority. ACS CAN gives ordinary people extraordinary power to fight cancer. For more information, visit www.acscan.org. 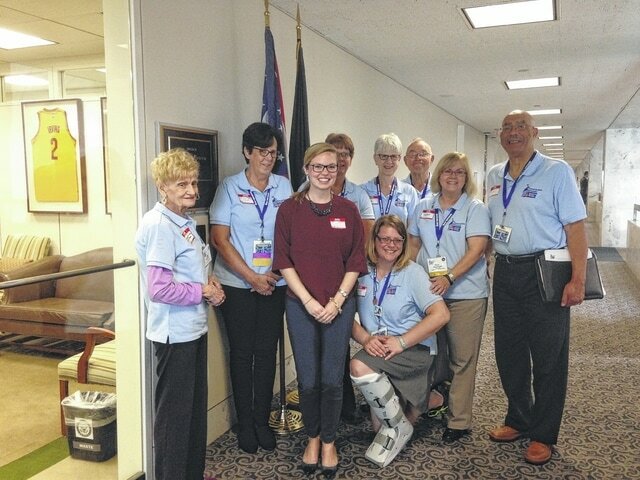 https://www.urbanacitizen.com/wp-content/uploads/sites/36/2015/10/web1_stevens_brown.jpgThe local delegation traveling to Washington, D.C., and posing here outside Sen. Sherrod Brown’s office, included, back row from left, Barb Wilinski, Barb Diver, Donna Shaw, Becky Schindler, Clete Schindler, Pam Manges, Warren Stevens, front row from left, Nikki Hurt (Sen. Brown staff member) and Lauren Coatoam (kneeling). Submitted by the American Cancer Society Cancer Action Network Inc.